Biofuels are alternative transportation fuels that are made from agricultural crops and certain types of trees. In efforts of reducing the consumption non-renewable resources, biofuels have been investigated to be renewable additive or all together replacement for gasoline as a transportation fuel. Our Biofuels Team is exploring a method using fast pyrolysis with biomass to produce a viscous bio-oil which can be converted into transportation fuel. Our goal is to increase the overall efficiency and amount of bio-oil produced. We will focus on conversion of woody biomass (poplar chips) using the pyrolysis pilot plant at the APSRC building near the airport. 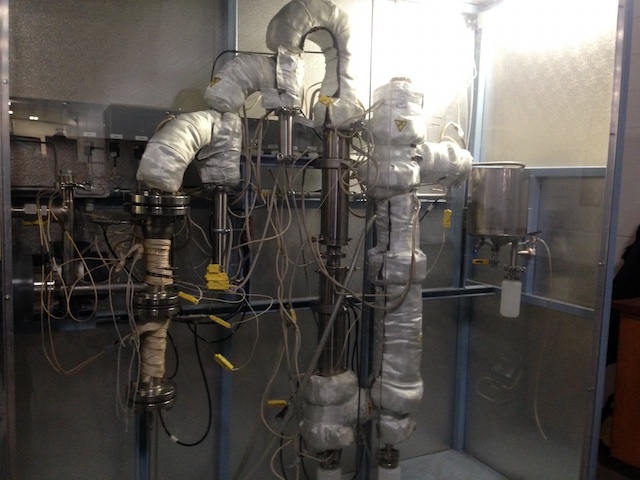 Students will gain experience in preparing and conducting the pilot plant runs involving a set of complex unit operations including a fluid bed reactor, two cyclones, two condensers, and a demister. Products of pyrolysis will be characterized using analytical instruments on campus where gas chromatography-mass spectroscopy and bomb calorimetry tests are conducted. Students will also learn about process safety to identify and mitigate hazards inherent in the process and methods to evaluate alternative energy for sustainability. One option to mitigate hazards is to conduct detailed process design and analysis using computer-aided tools such Aspen Plus and SimaPro. The Biofuels team is working towards optimizing a pilot scale fast pyrolysis plant in order to increase the yield of bio-oil from the reaction. The thermochemical conversion of the biomass produces hot vapors and char which are sent through cyclones, condensers, and an electrostatic precipitator. These unit operations are designed to remove all of the solid char leaving the reactor and to condense the vapors for collection. After collecting all condensable vapors, the liquid bio-oil formed can be catalytically upgraded to produce biofuel for transportation and other engine applications. The overarching goal of our team is to work towards a higher bio-oil yield. Current objectives include improving the heat transfer within the reactor by implementing a new heating design in both the gas preheating and reactor sections of our reactor, creating a metal replica in order to observe the effect of having the heater inside the reactor, and running the pilot plant again in order to confirm previous operating condition suggestions.